Most people tend to be timid about using enough salt in a vinaigrette, but the right amount—which may be different for each of us—really accents salad's "green" flavors. Prep Time: about 10 minutes. Notes: If chervil, a feathery herb with a faint licorice taste, is not available, use more tarragon. 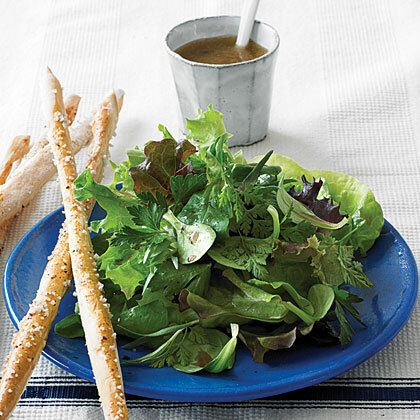 Use really flavorful olive oil and vinegar to help transform salad from ordinary to memorable. In a salad bowl, gently combine lettuce and herbs. In a small bowl, whisk together oil, vinegar, and pepper. Whisk in half of salt and taste dressing with a piece of lettuce. Add salt to taste. Pour dressing over salad and mix to coat greens.